Happy Anniversary to My Mom and Dad! Family Recipe Friday - A Squash Kind of Day! 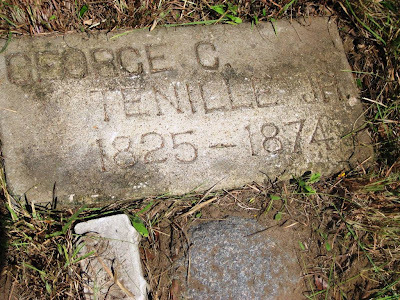 Wordless Wednesday - George Culver Tennille, Jr.
Tombstone Tuesday - George Tennille, Jr.
A gentle reminder that YOU make your own destiny. Our family's may have been a part of our heritage, but we determine where we are going! Than herein set out, the use, occupation, rights and privileges granted hereunder shall immediately terminate. Corporate seal to be affixed this 19 day of May 1970. Arrival on the ship "Patrick Henry" in New York, NY via London, England coming from Germany. 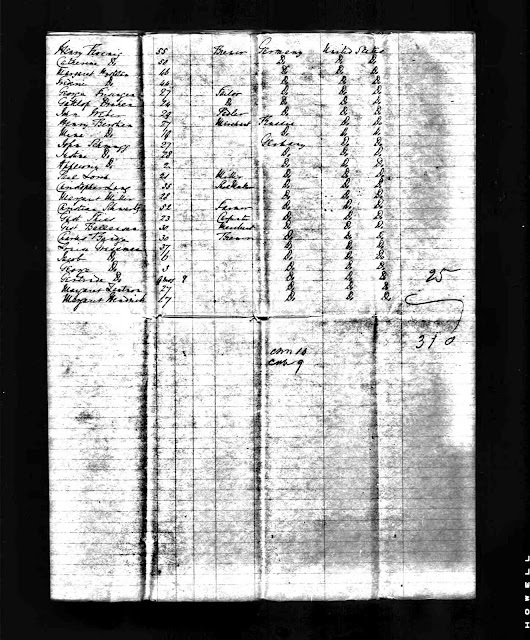 Passenger listed before Gottleib [listed as Gottlob] is a George HUNSINGER. This could be a relative of Gottlieb's wife, Sarah HUNSINGER. George HUNSINGER is listed on line 5 and Gottleib Dreher on line 6. 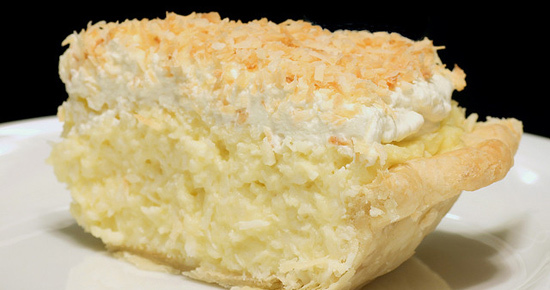 For years I have tried to woo my Aunt Mildred’s delicious coconut cream pie recipe from her. She will always respond with “a little of this and a little of that”. Finally I decided one day to watch her make the pie. I have never perfected her crust, but the pie itself… well, this is probably about as close as I can ever hope to come!!! Take the eggs out of the refrigerator an hour or so before you are going to make the pie. A key to getting a good high meringue is that the egg whites be at room temperature. Place the pie shell on a cookie sheet. Bake the pie shell in a 350 degree oven just until it's lightly browned. About 15 minutes. Whisk together the sugar, egg yolks, cornstarch and milk in a pan over medium heat. Stir frequently until it starts to thicken and bubble. Once it is thick add the butter, vanilla, and a cup of coconut and stir together. Pour filling into the pie shell. For the meringue, add 1 tsp. of baking powder to the egg whites and start to beat the whites with an electric mixer on high. Gradually add in 4 Tbs. of sugar, continuing to beat. When stiff peaks start to form (this takes some time) add in 1 tsp. of corn starch and 1 tsp. of vanilla. Don't go too heavy on the vanilla or it will change the color of your meringue or use the colorless. Make sure your bowl and beaters are completely clean and dry before you start making the meringue. Any oil or residue will cause the meringue not to be high and light. Spread the meringue over the pie and be sure to seal the meringue to the edges of the crust all the way around. Sprinkle with 1/2 cup of coconut. Place in a 350 degree oven until it just starts to brown. It takes about 10 minutes. Yesterday we posted this photograph. 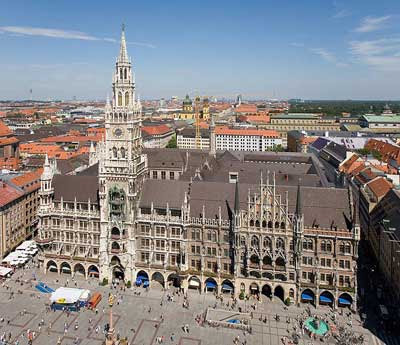 Were you able to correctly guess the location? Athens, Greece looking up the hill to the Parthenon. Each Thursday I post a different picture of someplace I have been. Be sure to leave your guess in the comments, and then come back tomorrow to see if you were correct! 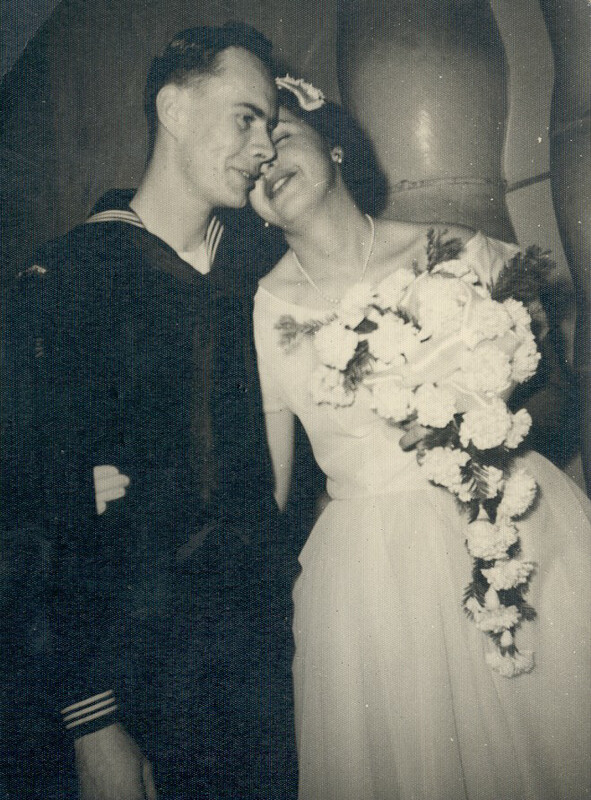 54 Years Together and Still Going Strong! Happy Anniversary Mom & Dad!!! 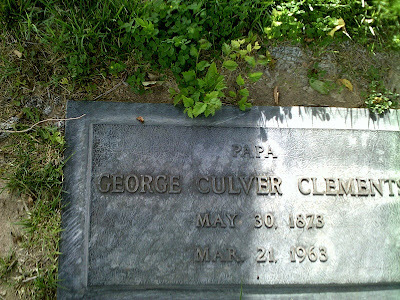 George Culver Clements was the second born child of Joseph Hardin Clements [1849-1927] and Sarah Jane Tennille [1856-1934]. 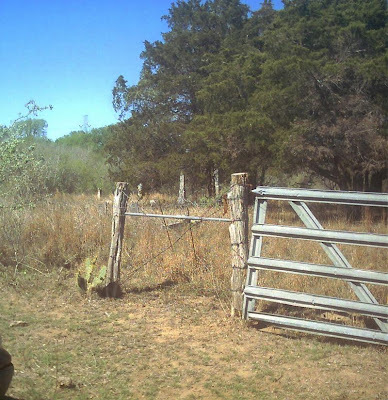 He was born in Gonzales County, Texas. His grandparents on both sides were early white settlers in the Republic of Texas. 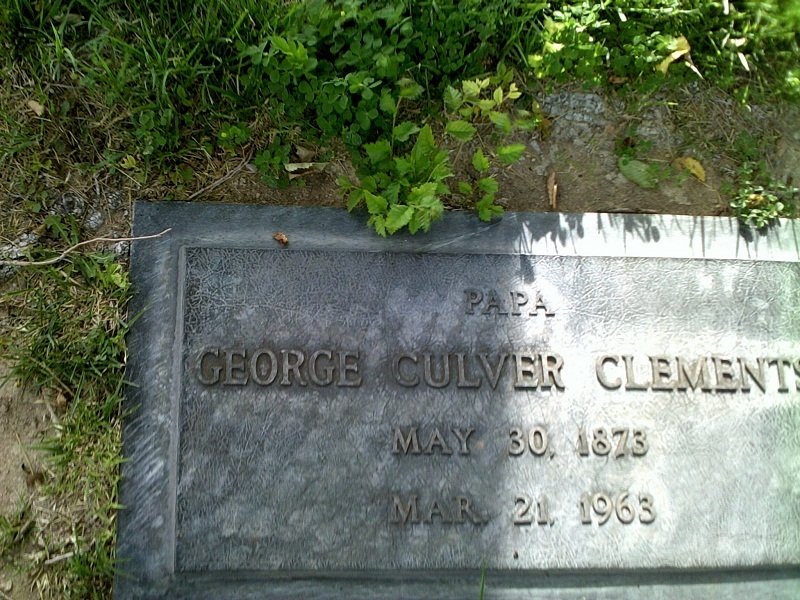 George Culver Clements died in Albuquerque, Bernalillo County, New Mexico. 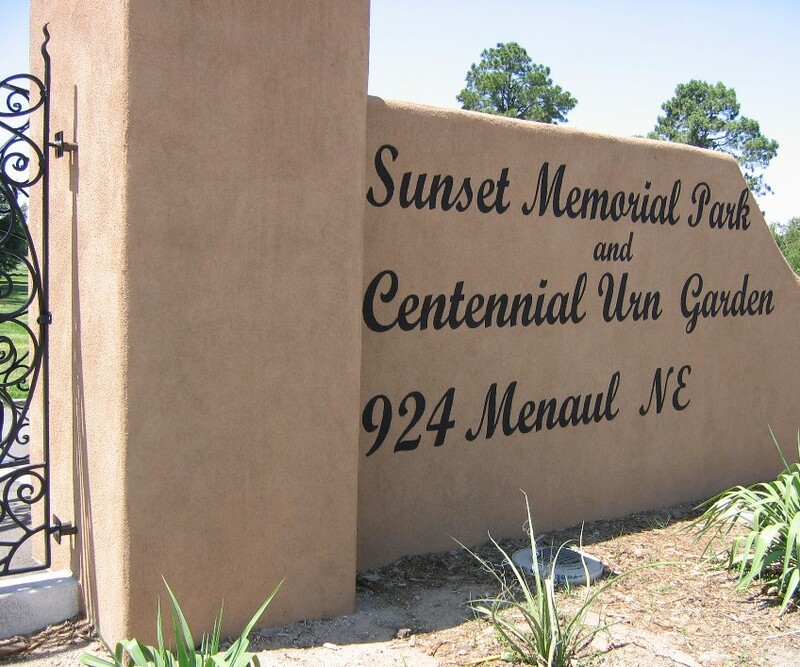 He is buried at Sunset Memorial Park in Albuquerque. 1825 in Saline County, Missouri. 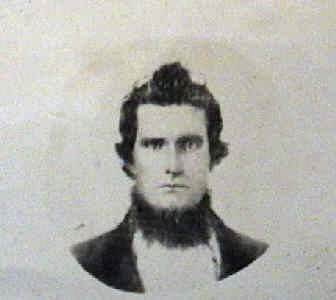 He died on 08 Jul 1874 in Sedan, Gonzales, Texas. 63. Amanda J. BILLINGS was born in 1840 in Tennessee. 125. 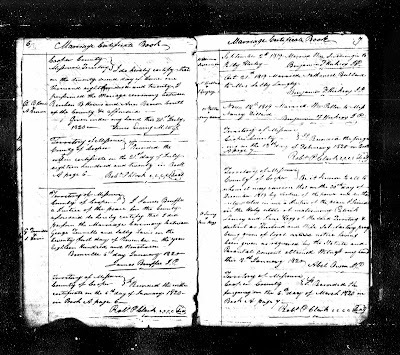 Sarah DAVIS daughter of Warren DAVIS and Mary KINCHELOE was born in 1796 in Kentucky. Each Friday I share a recipe with you, that may or may not be from an ancestor. Most of these are recipes that I use all the time in my cooking, and are recorded here for my grandchildren when they get older. 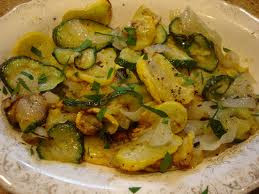 Today I want to share with you my yellow squash and zucchini with onions. First, let me assure you, that if you are looking for a dish that has great presentation, this is NOT the one you want to use! It doesn’t present well. But if you are looking for the simplest, easiest and tastiest veggie dish ever, then this is the one! Prep time is minimal [maybe 5 to 10 minutes, tops! ], and the cook time is about 15 minutes! So it’s really fast. Very healthy. And the taste is unbelievable. With a sharp knife, slice the squash and zucchini into thin slices. In a large skillet over medium heat, melt the butter. Toss in the onion slices. Stir fry just until the onion begins to get translucent, then add the squash and zucchini and fry just until they begin to soften. Add salt and pepper to taste, and serve. This makes an excellent side dish. I have also added fresh chopped tomato, and topped with shredded parmesan cheese. How many ways can you think of to “dress” this dish up? and asked you to identify the location. Were you able to identify the train station at Ansbach, Germany? 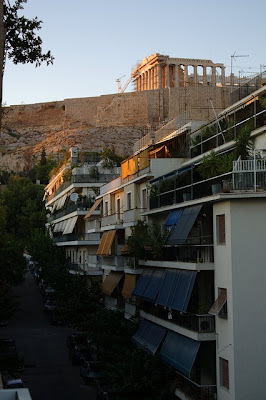 Each Thursday I am sharing a photograph with you of my travels. I also ask you to try to identify the location that is shown. Correct answers will be given each Friday. Post your guess below, then check back tomorrow for the correct answer! Historian and author, George McLean, will be presenting a talk at the Monroe County Historical Society in Union, Monroe County, West Virginia on Saturday, December 8th at 1:30 p.m. He will be discussing the Skirmish at Pearisburg during the Civil War. Please come out and hear this speaker! You will find his information fascinating! Born 29 Dec 1825 in Saline County, Missouri, George Tennille Jr. was the third born of eight children to George Tennille, Sr. [1771 – abt 1860] and his wife, Sally Davis [b. 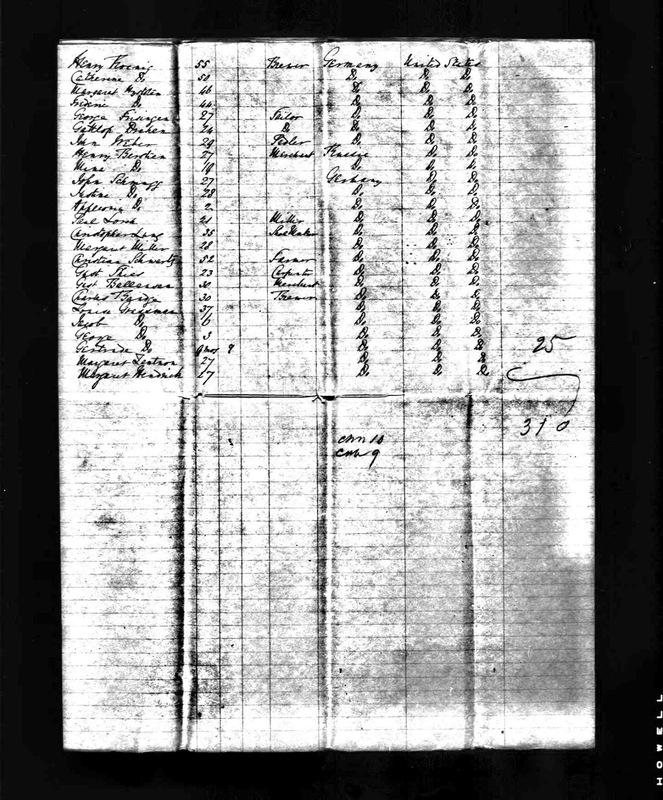 1796]. 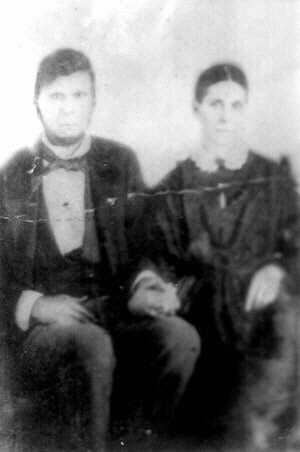 On 2 July 1846 in Gonzales County, Texas, George married Anastasia Brown. Nothing is known of her. On 19 July 1853, George married Ann Sample in DeWitt County, Texas. Once more nothing is known of this woman. One may presume the above three women met with illness, tragedy or childbirth and died shortly after their marriages. There is no documentation providing us clues to their demise. George served in the Confederacy during the Civil War and was a scout interpreter for the Cavalry after the War. He died 8 Jul 1874 in Sedan, Gonzales, Texas. He is buried at the Billings Cemetery, located in Gonzales County. George Culver Tennille, Jr. was my husband’s gr-gr-gr-gr grandfather. Billings Cemetery, Gonzales County, Texas. PERKINS. 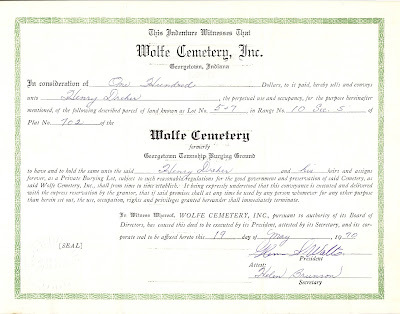 He married Mary Elizabeth FAUDREE on 01 Dec 1935 in Covington, Alleghany, Virginia. 5. Mary Elizabeth FAUDREE was born 03 June 1897 in Monroe County, West Virginia. 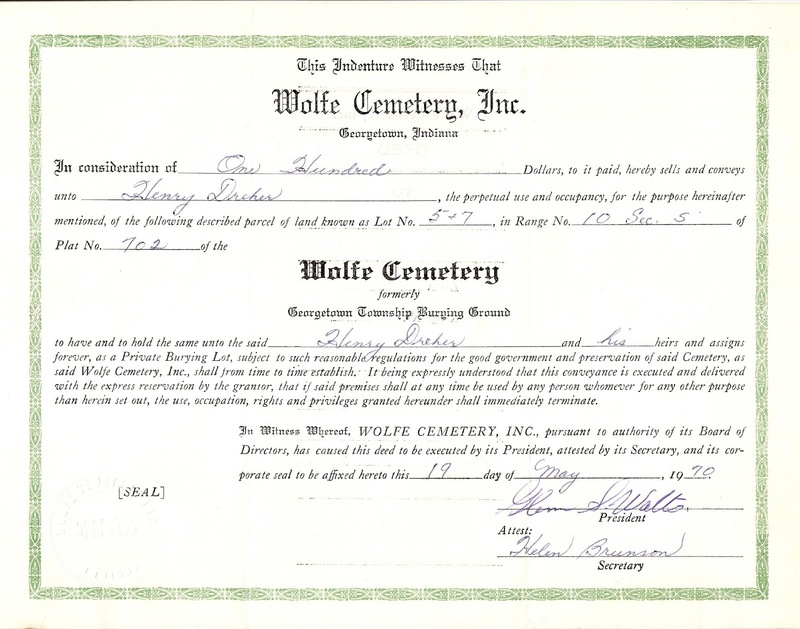 She died 01 Jan 1975, Clifton Forge, Alleghany, Virginia. She was the daughter of Stephen Ledford FAUDREE and Elizabeth CARNEFIX. 32. William McBEAN. 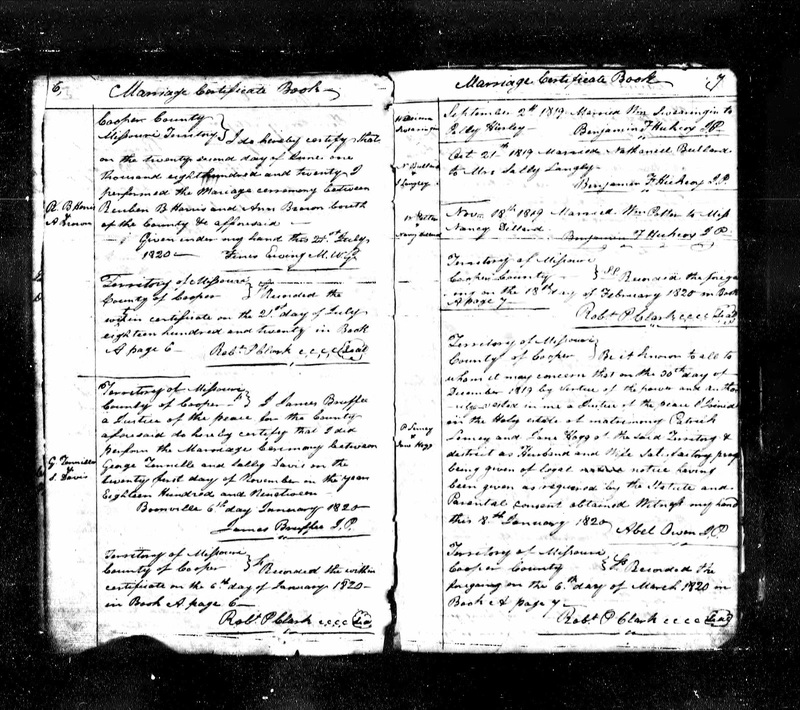 He died about 1804 in Monroe County, Virginia. He was married to Sarah.